In today’s increasingly hectic world, the bedroom is a place of solace. It’s where we restore ourselves through sleep, curl up with a good book, or share time with those we love. The bedroom is a space we can personalise to fit our own specific tastes and needs, perhaps more than any other room in our homes. Many are deterred, however, by making a costly investment in a space that hardly anyone else will see. Yet the bedroom is so critical to our well being that of course, it’s important to take special care of it! No matter your budget, there are lots of simple and creative ways to revamp your bedroom into a place that both welcoming and calming. So instead of trying to figure out how you can positively change your bedroom and without breaking the bank, let homify inspire you with these 6 clever ideas! Today, there are lots of quality pieces available for affordable prices that come from an unexpected place: the past! Many contemporary trends are even designed to mimic more antique styles. Outsmart them by refurbishing your own vintage pieces or buying vintage furniture that has withheld the test of time for remarkably cheap. With a simple coat of paint or polish can cast any vintage piece of furniture in a new light. 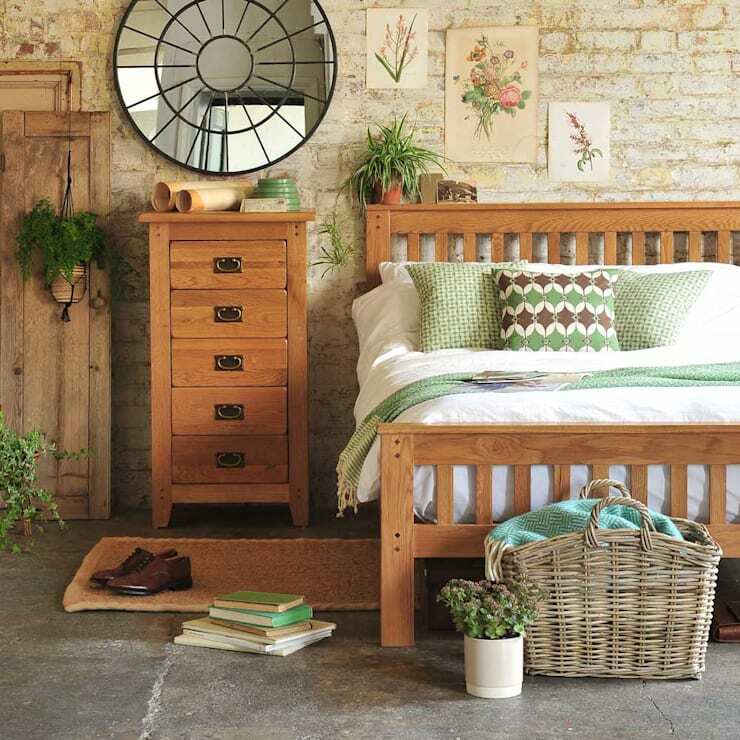 Or keep the aged style to add a rustic, shabby chic element to your bedroom. This option adds character and can make your bedroom more unique. In this example, we love the way that this person repurposed a vintage vanity into a desk. It fits seamlessly into the corner of this space. The two-tone unfinished surface of the desk complements the exposed brick wall so well, that it makes the wall fit more cohesively with the rest of the space as well. There are really an infinite number of possibilities with this simple tip to transform your bedroom on a limited budget. You don’t need to be an artist either! Instead of experimenting with new wall colour, paint a portion of the wall with chalkboard paint, and invite friends and family to draw kind messages and doodles in colourful shades. Stroll through a local flea market to create a more eclectic collection. Frame gifts and small mementos from friends or loved ones or simply search the web for meaningful paintings and illustrations created by skilled craftspeople. If you’d still like to take matters into your own hands purchase some sticker murals, and presto! 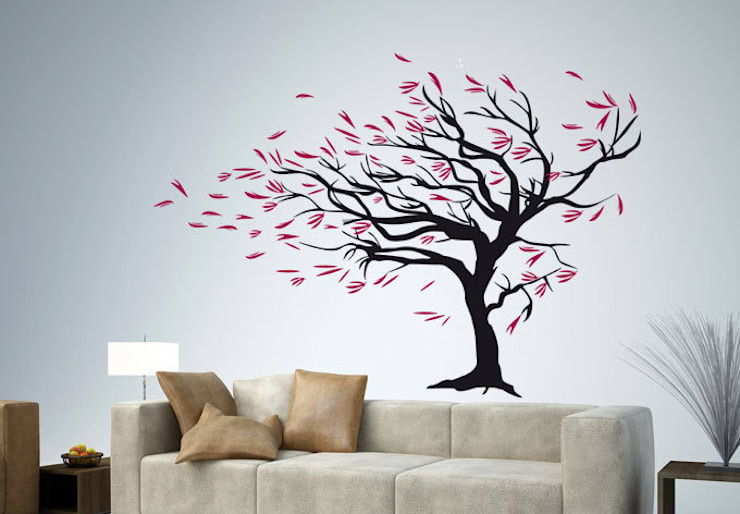 Notice how much more lively and imaginative the bedroom would appear with the simple adherence of this sticker mural like this one. Such sweet dreams could be had under this tree! In just one afternoon, you can easily transform your bedroom with a fresh coat of paint. This is a simple way to make your bedroom more exuberant in desired ways. Go from stuffy or claustrophobic to refreshing and expansive with the right shade. Colour can really affect your mood: while blue promotes relaxation, red can make the space feel more vibrant. For an especially distinguishing variation of this tip that can be attained in a fraction of the time, only paint one or two of the walls in your space. It will add life and dimension that can even make the room feel larger. This room has become much more original merely through painting one of its walls. 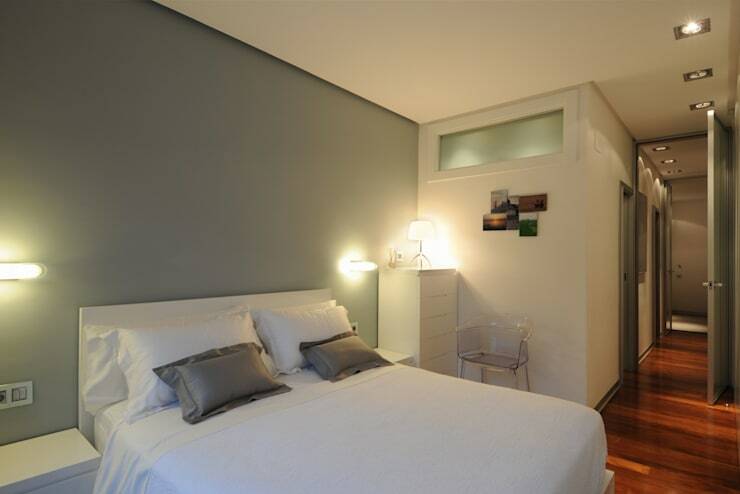 The lighting in the room takes on an entirely different character as it blends with this lovely grey green shade. This is a great complement to a minimal headboard as well. 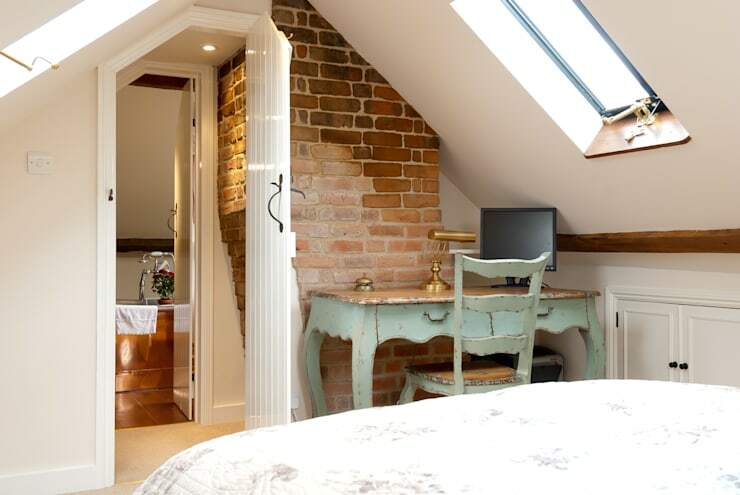 Perhaps the simplest suggestion on this list, clearing away the excess clutter in your bedroom really ought to be the first step in any redecoration scheme. It’s a wonder what a few minutes spent each day stacking books onto shelves, making the bed, putting dirty clothes in the hamper, and arranging plants and decorations can do to make the bedroom feel more peaceful. This bedroom feels much warmer and more inviting simply because it is organized. 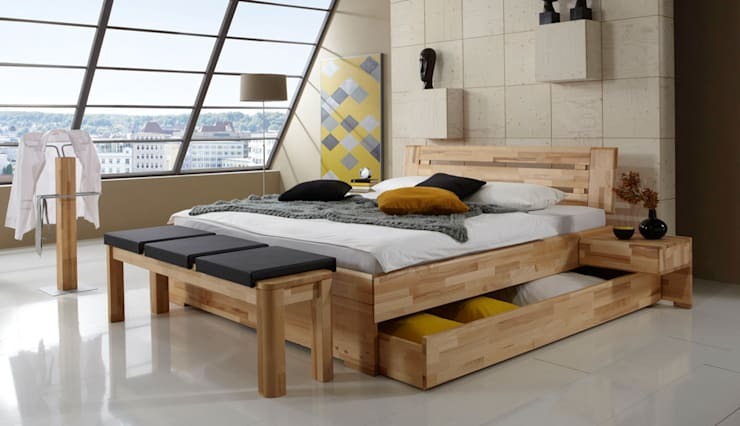 If you find that there is simply not enough space in your bedroom for the amount of stuff you have, there are many different storage options available from shelving units to storage containers, investing in organization can make your bedroom feel far more inhabitable. Alternatively, it can be even more liberating to say goodbye to the excess by selling or donating unwanted items and subsequently freeing your space. Piggybacking on the previous suggestion, a great place to store items in our bedrooms is under the bed! If space is limited or your closet is small, opt for a bed with built in pull-out drawers for storage. This person, for instance, stores extra linens inside of the bed’s built-in drawers, freeing up space and allowing for more open space and a better flow of energy throughout. If purchasing a new bed for the purpose of increasing storage in your home is not within your budget, it is also possible to maximize storage under the bed. Simply purchasing boxes or containers for under the bed storage can have more or less the same transformative effect. There are definitely decorative options that won’t take away from the decorative appeal if they peak out from underneath. We cannot stress enough what a difference minimizing the clutter in your bedroom can do for increasing both aesthetic appeal and feelings of well-being during time spent in your bedroom. 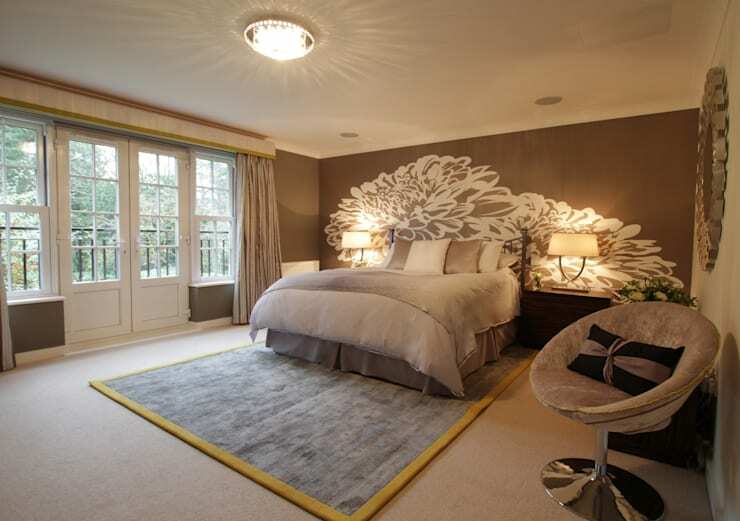 Lighting plays a crucial role in cultivating a welcoming bedroom. Harsh lighting can contribute to feelings of discomfort, stress, and inability to sleep. Try a light with a built in dimmer switch to adjust the light’s intensity and brightness to your preferences. With the right lampshade, you can also soften the light in your bedroom while using it as another opportunity to add a personal touch to your bedroom. Notice the warm glow emitted from the symmetrical lampshades in this example. The lampshade both provides a pleasantly filtered amount of light and unifies the white mural and the coffee coloured walls. The light is also enhanced by the light positioned in the centre of the ceiling that comes equipped with a dimmer switch. Whether the inhabitants of this bedroom are waking up or winding down, there will be an appropriate level of light to ease them. If you liked this Ideaboook about redecorating your bedroom, then have a look at these other bedroom ideas! Were you inspired by this Ideabook? We'd love to hear your thoughts in the comments section, below!